Master Henry Seishiro Okazaki (1890-1951) was born in the town of Kakeda, Japan and came to Hawaii in 1906. In 1909, he was diagnosed with tuberculosis of the lung, which in those days was a death sentence. Feeling that he was going to die and had nothing to lose, he took up the study of Judo at the Shinryu Kai School under Mr. Kichimatsu Tanaka, a professor of Judo. Okazaki threw caution to the wind, abandoning his very life, and engaged in the rigorous mental and physical aspects of Judo drill training. As his training continued, Okazaki was surprised to find that a miracle had occurred. His body had completely healed. He held Judo training responsible for saving his life. He decided to dedicate his life and make a profession of teaching Judo. Master Okazaki continued to study Judo and acquired a black belt in Kodokan Judo. He furthered his study of Judo by investigating its roots. To accomplish this, he studied the jujitsu systems of Yoshin Ryu, Iwaga Ryu, Kosogabe Ryu, Shibukawa Ryu and Nabashoshine Ryu. Besides these, he also studied Karate from Japanese master from Okinawa, Knife fighting techniques from a Filipino, American boxing and wrestling, throwing dirk from a Spaniard, the secret Hawaiian art of Lua, and Mushi-jitsu, a form of boxing with intent to kill from an old Chinese Master named Wo Chong. Master Okazaki named this style of judo-jujitsu, Danzan Ryu Jujitsu, Sandlewood (or Cedar) Mountain system. He started to teach everyone Judo regardless of race, color, or religion. This was the name of Master Okazaki’s dojo in Hawaii. The name KoDenKan may be translated as “The School of the Ancient Tradition” or as “The School in Which Senior Students Transmit the Tradition.” The method of instruction requires senior students to teach less advanced students in the spirit that Master Okazaki declared was inherent in the Hawaiian word Kokua: “to mutually help one another.” Known as the “Father of the AJJF,” we honor his efforts and success in establishing Judo-jujitsu in the United States. The basic curriculum of Danzan Ryu Jujitsu (kanji shown at right) training begins with basic stretching and strengthening exercises. Next, students learn rolls and falls that allow them to be thrown safely. The system is arranged into lists of techniques, which teach the basics of balance, leverage and momentum. The first lists taught below Black Belt level include Yawara (basic holds and escapes), Nage No Kata (basic throwing arts), Shime No Kata (grappling arts), Oku No Kata (advanced combination arts) and Goshin Jitsu (self-defense arts). The remaining lists, which are primarily taught to advanced students and Black belts, include advanced combination techniques; defenses against gun, knife, staff and sword; yawara stick arts; and a system of resuscitation and restorative massage techniques (kappo). The American Judo and Jijitsu Federation (AJJF) traces its history from Master Okazaki. Several of Master Okazaki’s students who came to the mainland in the late 1930s began establishing schools and teaching the techniques of DanZan Ryu. 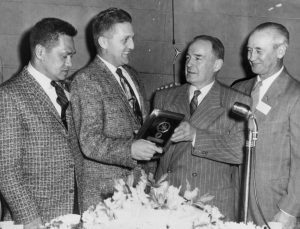 Four of his students, John Cahill, Bud Estes, Ray Law, and Richard Rickerts. (pictured above [left to right]) became the founders of the American Judo and Jujitsu Federation, wishing to help fulfill Master Okazaki’s dream of having a DanZan Ryu school in every state of the union. 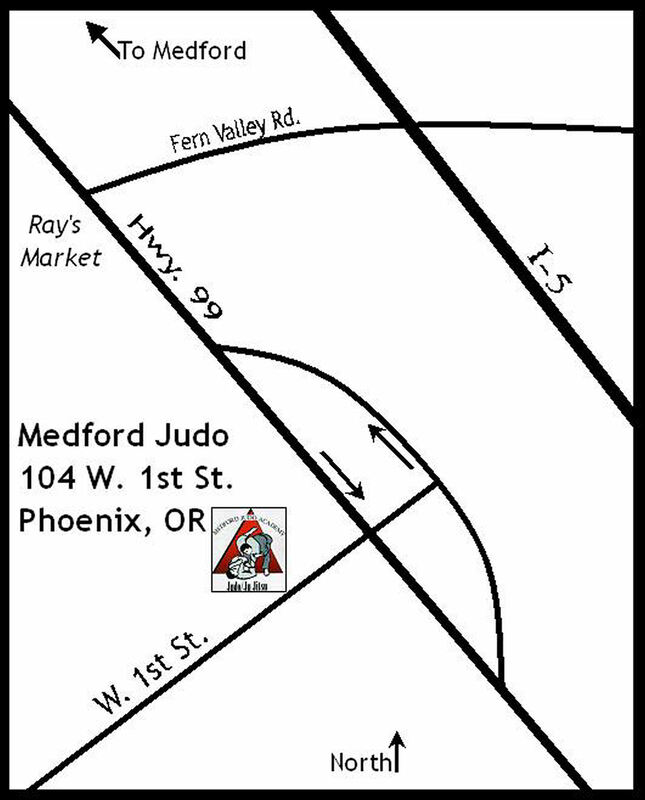 Medford Judo Academy got its start in 1958 when Tom Ball, Shodan from Redding-Chico area, started working on Jujitsu with Larry Nolte at the Medford YMCA. In 1959 our small group left the YMCA and moved to the park. When winter approached we moved to the Medford Senior High School weight room. 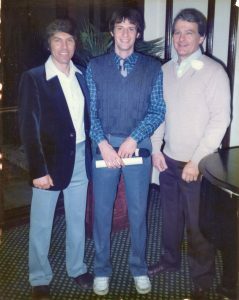 We added some key members: Mike Byrne, who started the Redding Judo Academy; and Dr. Paul Rutter, D.O. a Chiropractic specialist who helped with the American Judo & Jujitsu Federation in its early development with corrective manipulation. The club patch is based on a circle with a red triangle in the center. The points of the triangle stand for development of mind, body, and spirit. The black circle background represents the infinite. 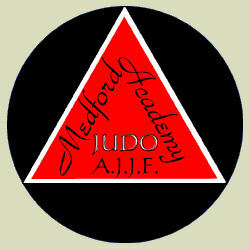 The Medford Judo Academy is the oldest Danzan Ryu Jujitsu school in continuous operation in the same location. Over 40 students have been promoted to Shodan or higher degrees. We have been at the same location since 1960.